AUGUSTA -- Leigh Rose chose a skull from the table and held it up for Rita Clement's pre-kindergarten students to see. 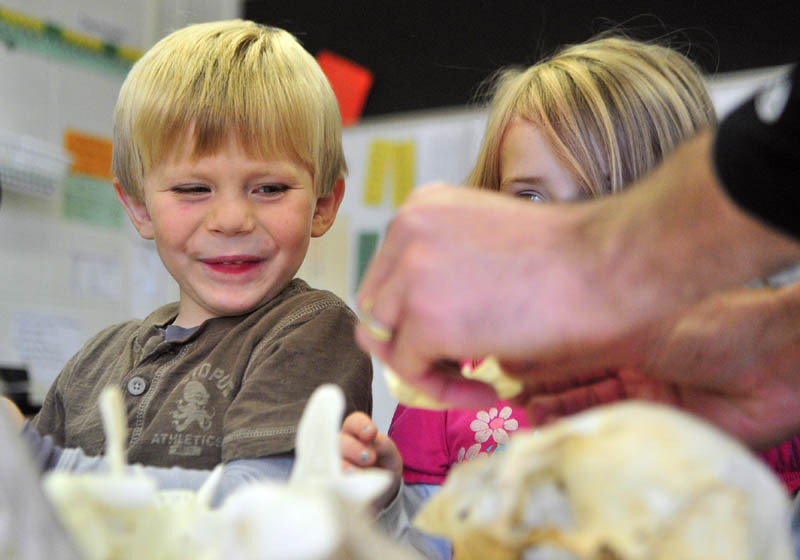 AUGUSTA — Leigh Rose chose a skull from the table and held it up for Rita Clement’s pre-kindergarten students to see. “Does anyone know whose skull this is?” Rose asked. He provided a couple of hints. The eye sockets were on the skull’s sides — because the animal likes to hide, Rose said — and it had the flat teeth of an herbivore. Students made a few guesses. “A dinosaur!” one boy said. When Rose picked up an antler from the table and held it atop the skull, the students caught on: It was a deer. At Gilbert Elementary on Wednesday, nearly 100 pre-kindergarten students learned what to call animals that eat meat or plants, how soft a skunk’s fur is and that a woodpecker’s tongue is so long it wraps partway around the bird’s skull. Rose is an educator for the L.C. Bates Museum at Good Will-Hinckley, and his visit to Gilbert on Wednesday was the second of six weekly natural science presentations for the school’s youngest students. A grant from the Institute of Museum and Library Science and a gift from Skowhegan Savings Bank are allowing museum educators to do similar presentations for preschoolers around the region, expanding on a few years’ worth of programs for second- and fourth-grade classes. L.C. Bates Museum Director Deborah Staber said museum educators will visit 106 classrooms this year. Some of the presentations are habitat-based, like the ones focused on forests that Rose gave on Wednesday. Others focus on Maine species within a specific group of animals, such as birds or fish. The students at Gilbert had the chance to feel animal pelts, listen to bird calls and make nature-themed necklaces. Evan Pitcher marveled at a taxidermied bear’s paw. Science standards for early childhood education require exposing children to nature, Clement said, and the museum series provides a vivid way to do that. Clement said programs like this take the place of field trips that have been cut from school budgets, and Staber said that’s the case for many schools. Children that take part in the classroom program are invited to attend special family days at the museum, so the presentations also raise the museum’s profile, Staber said. This year is the first of a two-year grant for the preschool programming.